Unam Sanctam Catholicam: What's Mass all about? I knew of a certain person once who insisted on going to Mass every single day. This of course is a pious and most admirable thing to do - if they failed to get to Mass daily, they were very upset and felt that they had let God down in some manner. In almost all ways they considered daily Mass attendance to be essential. I say almost all ways because there was one exception - if this person had committed some sin and needed to go to confession before Communion, they would simply not go to Mass at all. I always found this odd, given their insistence on making it to daily Mass under normal circumstances. But in this case, everything they normally thought about the necessity of daily Mass was no longer in force if they couldn't receive Communion. In effect, they were believing that the sole value of attending Mass was in the fact of reception of Holy Communion; if they could not receive, why bother going? I had an interesting talk with this person recently about this (who gave me permission to use them as an example) and we discussed how in this approach, we actually place ourselves as the center of the Mass if all the importance is on the question of whether or not we can receive. Reception of Communion is tremendously important for holiness and the reception of grace. But the central importance of the Mass is not in whether or not we can receive Communion, and if we can't receive Communion, it is certainly no excuse for not going to Mass or for discontinuing a pious practice. I think this confusion is due in part to a lack of solid catechesis on the Sacrificial aspect of the Mass. The preeminent value of the Mass is that Jesus Christ is offered to God the Father. 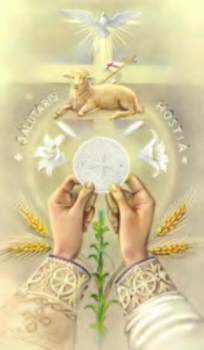 This is the primary way that God is glorified through the Mass - our reception of Holy Communion is distinct from this offering and is ordered towards us - it is the primary way that we are sanctified. It is easiest to appreciate this distinction in the fact that the reception of Holy Communion can occur outside of Mass: through a Communion service, having it brought to you when you are in the hospital, as Viaticum, etc. But the Sacrifice of the Mass can only take place in the context of Mass - you can't have the Holy Sacrifice of the Mass outside the Mass. There are other distinctions, of course, but this is the easiest to explain to someone who is perhaps unfamiliar with the concept. Now this person goes to Mass whether or not they can personally receive Holy Communion, understanding that the Mass does not lose its value if they cannot personally receive the Sacrament. In this case, the acquaintance with many excellent old prayers about making spiritual communions were especially helpful. And of course, this more complete understanding of what the Mass is has certainly produced more fruitful communions, which have in turn been a source of more abundant grace and aided this person in not having to refrain from reception so often. Has anyone out there experienced similar situations to this, where persons attach all the value of the Mass to the act of receiving Holy Communion? Is this something you have heard your pastor preach on recently? I am interested to hear any relevant comments or feedback. Why do you go to Mass every Sunday? Let's imagine you couldn't receive Holy Communion that day: why are you still obliged to go to Mass? Let's imagine you and the priest were the only ones there... no, let's imagine that no one else could show up, and it was just the priest: why would he still say Mass? I think it caught most of them off guard that the Mass wasn't, in the end, about RECEIVING Holy Communion, but about GIVING God the adoration and thanksgiving He is due (as well as its expiative and supplicative ends). I don't know if I've ever had a person-to-person talk with someone about this, though. I have no such concrete examples, I'm afraid, but I've long had the impression that this is the way in which many view the Mass. The almost universal reception of Communion at Mass - I mean barely anyone present at a Mass ever abstains from receiving - may be related to this way of thinking about the Mass, in addition, of course, to the more decisive factor of the loss of the sense of sin, and the abandonment of Penance. that comment was met with incomprehension, to say the least. So I worked that idea into other classes, and it created the same confusion. I got the sense that they all felt that Mass is a "service" offered to them by the local parish for the purpose of "full participation in a community act" which includes receving Holy Communion. You are right, many seem to place the purpose of the Mass in the act of receiving. From what I observe, their concept of sacrifice and of The Holy Sacrifice of the Mass is vague. They seem to know only what they've picked up by themselves as Catholics in attendance, observing what's going on. We are sorely in need of good catechesis. Thank you for your observations here. This is similar to what I talked about in the past regarding people believing in the Real Presence but not the Real Sacrifice. I meet people all the time who do not know the Mass is actually a Sacrifice. There are many reasons for this ignorance. One reason is the new Mass is not as good at defending against these kinds of errors as other forms and rites of Mass. The New Mass is less explicit about sacrifice and probably 90% of the time is offered in a way using forms and options that look less like the priest is offering a sacrifice (like the priest facing the people and vernacular just to name a few). I mentioned this to my brother just a few days ago. He confused the obligation to go to Mass every Sunday and Holy Day of Obligation with the precept to receive Communion at least once a year. Also, this misunderstanding of Mass means that people who haven't managed to get to Confession before Sunday Mass often feel pressurised or judged if they don't communicate, because it's seen almost as obligatory as attendance at Mass itself. Sure, I've personally heard one (pseudo)liturgist talking about, that he can't understand the sense of receiving a spiritual communion ('what does that mean'). Just another of many contradictions that the 'new theology' brings.